Yes, it’s that time of the year again… Time for the start of our Countdown To Eurovision. We’re off to Ukraine for this year’s contest, with the two semi finals set to take place on May 09 and 11 and the Grand Final on May 13. As we’ve done for the past nine years here at auspOp, we’ll be taking a look at each of the entries and giving them our critique in the lead-up to this year’s competition. 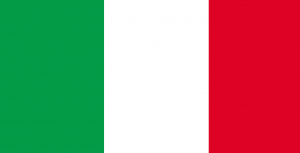 And we’re kicking things off today with a look at the Italian entry. As part of the “big five” (which also includes the UK, Germany, France and Spain), Italy doesn’t need to go through the rigmarole of having to win their way through the semi finals. They’ll turn up as part of the Grand Final on May 13 with hopes of winning it all. As in previous years, they’re serving up an Italian language track, ‘Occidentali’s Karma’. Performed by Francesco Gabbani, the track won the prestigious San Remo Music Festival early last month. And armed with his winning record, Francesco will be hoping to strike again in Kiev. The track’s bright and uptempo; a welcome distraction from what’s a ballad-heavy 2017 competition. Great stage production on the night could help this one pip the competition. And, as of right now, it’s favourite to win.